We did put up the lap siding, board and batten on the front door side, along with a small drip edge, although nothing is stained yet, so it is various shades of cedar. The white areas will soon be covered with cedar shingles, which will be gorgeous when done! And made a bunch of custom cables to run between the batteries, breakers, and inverter/charger. Got a lot of raised eyebrows at a Big Box store when I asked for 2/0 wire. (Guy looks at chick, thinks she’s confused, and says, “You mean, like 12 or 14 gauge wire with 2 wires? Like, you know, the kind in your house?” Sees my face, then asks, hesitatingly, “Or you mean, really big wire?” Similarly, the lady at checkout asked me no less than three times what I was using the wire for, but first asked me if I bought it there. That wire weighed a lot and made about a 30″ dia loop when coiled, so you guess how likely it would be that I brought it from home. When I told her it was for a 12v system, she looked even more befuddled). Bought their last 15 feet of the stuff, and proceeded to find that they do not carry terminals in 2/0 size, only #2 size. Auto shops are not helpful, as they carry #2, at the largest, of both wire and terminals, in my experience. Ace Hardware to the rescue! They carry an array of all-copper, 2/0 ring terminals, for a cheaper price than buying off Amazon. Man I love those guys. We could have bought even bigger terminals, or in different styles if we wanted, because they’re that cool, and carry it all. Then to attach said terminals to the cables. For this, there are many professional-grade, hydraulic-assisted lug crimpers out there, and they cost a few hundred dollars. Harbor Freight sells one with individual dies for the differing gauges for $80, online only. 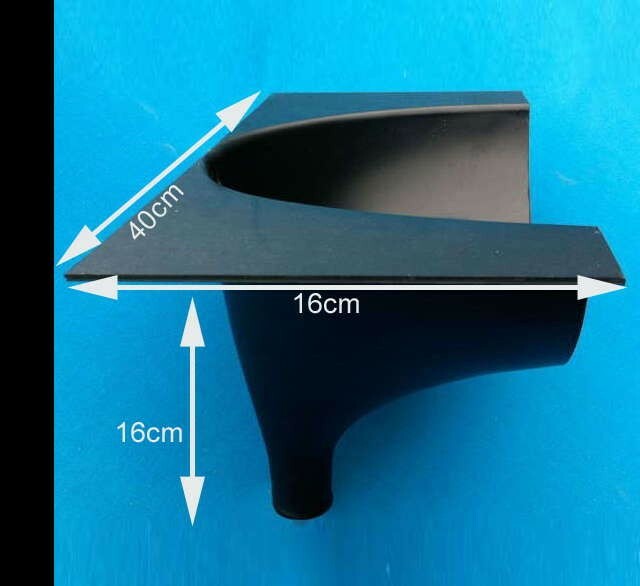 My dad told me about this mysterious metal block thingy with a plunger on it that you hit with a hammer, and after much hunting, found a single specimen at a big-box auto shop. It truly is just a heavy pin in a jig that you use to smash the lug with when you hit it with a hammer, called an “auto lug crimper.” Works great though, and cost $21. Ended up saving quite a bit of $$ making the cables ourselves, not to mention 2/0 cable is not too flexible, so you want exact lengths anyway. It’s stupid the things you view as triumphs, but we were pretty proud of that. 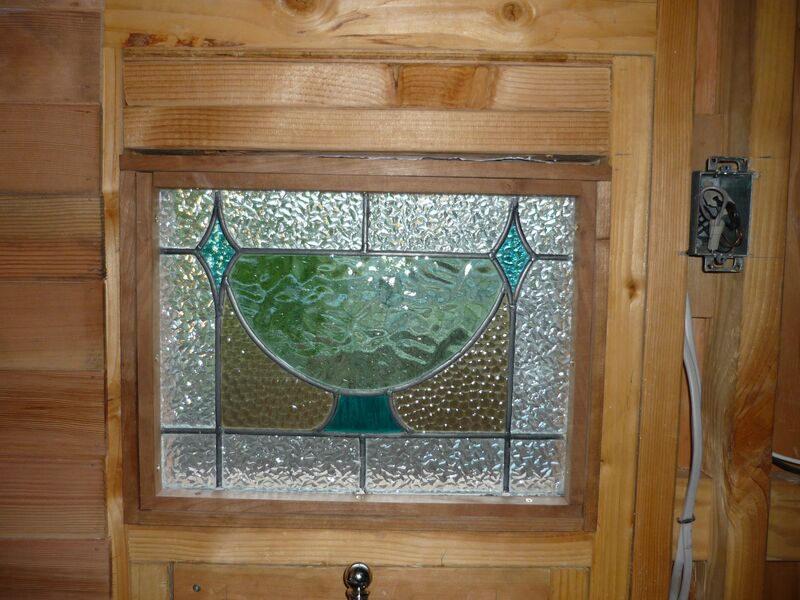 Also installed the last stained-glass window, over the kitchen sink. Like the other one, it is an antique from an English pub. We thought the goblet design was appropriate for the kitchen, set into a custom-made new cherry wood frame, with room left to install a second plate of glass on the outside to protect it and insulate better. And we talked to Monty, and he mentioned a few things that we will have to do before he *might* be able to pass us on inspection of the house for a homemade “park trailer” – vents are required on the sinks and tub, which he said can be “auto vents” which vent via a tee just past the P-trap to a side wall, and are one-way vents. 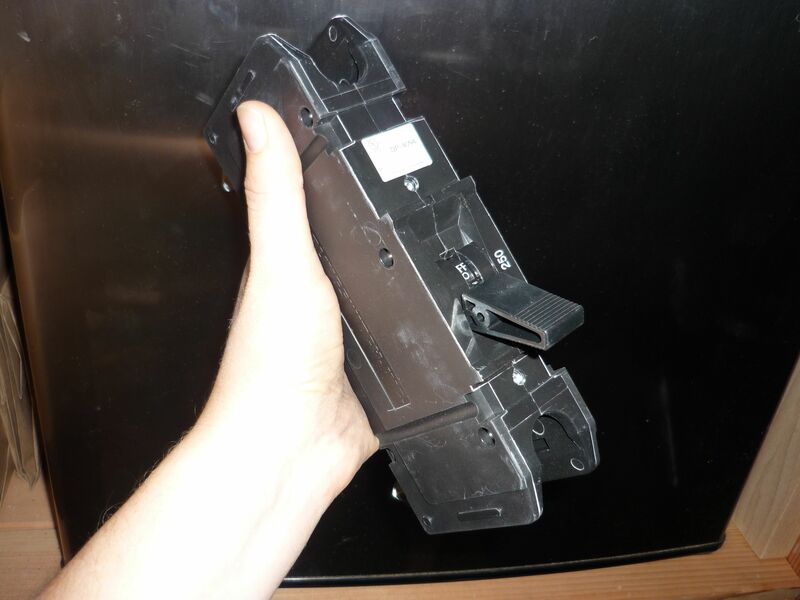 They look pretty inexpensive and easy to install, so we will probably try to do that. 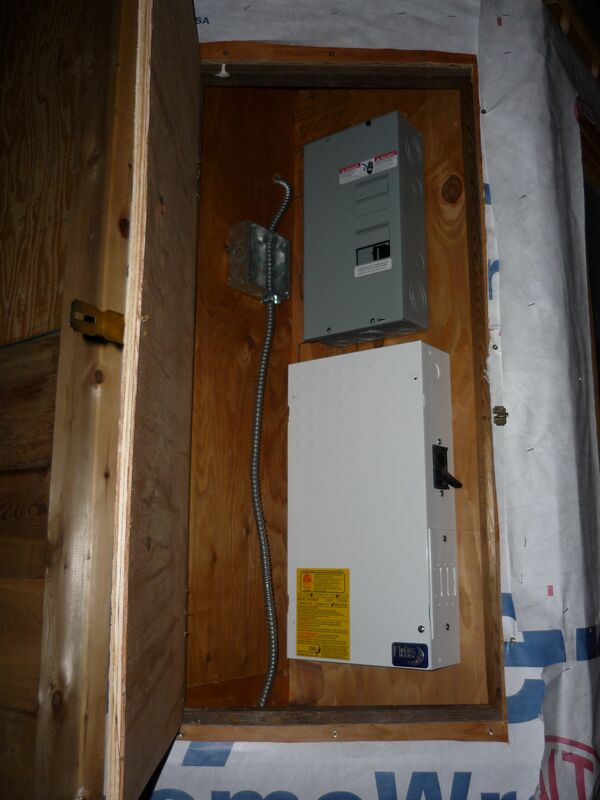 He also said a 30amp main breaker in the breaker panel is necessary, which I was thinking was a good idea anyway. And lastly, besides the smoke, CO, and LP/gas alarms which we already have, a “5BC” rated fire extinguisher, mounted near the front door, in a clearly visible place, is required. So maybe there is hope yet that we can have our house certified as a park trailer. We’ll keep you posted. Overall, we have not once felt that our house was too small for our needs, though. Which is funny, because that seems to be everyone’s concern. Our difficulties currently lie in working full time while completing our house, when neither of us are a plumber, electrician, sider or roofer. Perhaps it will be different once we have more built-in furniture, but we don’t think so. We’ll just be happy to be living less like transients. We have gone through several phases of toilet-care philosophy. Much like Cat, featured on The Tiny House Blog recently here, we have decided that much of the toilet hype is just that. Phase 1 was the Humanure Handbook philosophy, which goes something like: “Put it all in one bucket, cover with several inches of dry sawdust or similar, and then throw into a massive compost pile when the bucket is full.” Except since we are on a small, narrow lot, there is nearly nowhere to place a compost pile that wouldn’t be too close to a neighbor’s yard, so we were going to garbage-bag it into the trash. Problem was that unless you covered every single time (regardless of #1 or #2) with a large amount of mulch, it stunk, bad. If you did, the bucket filled up within a few days, and let’s face it, no one wants to be the one to change the bucket out, or deal with a really massive compost pile if you don’t have lots of property. Separation of #1 and #2, cover #2 with mulch, hang a separate cup in the front of the bucket for #1. Worked really well to decrease changeover of the bucket. Discovered that humans make a tremendous amount of urine daily, and that almost all of the bad smell from the toilet was from the urine, not #2. So instead, now we are emptying the pee pot daily, in loo of the bucket weekly (haha, get it? moving on…). Not a huge amount better, but slightly. If you slack off, there is, as the Scandinavians delicately put it, “A sulfurous odor associated with outhouses.” Not terribly nasty, but not really nice, either. So, we thought, there is a reason all those fancy expensive toilets (Airhead, Nature’s Head, etc) have urine separation and a closed urine collection system! Whaddya know? But, as Cat pointed out, those guys are spendy, and not the greatest. Some people we know with a tiny house have a Nature’s Head, and they said the urine bottle fills up almost daily, so aside from an improvement in smell, maintenance levels are the same. Many Scandinavian webpages recommend “washing down” the urine with a small amount of water, to dilute it so it doesn’t burn any plants in your drain field and also to prevent crystal buildup. We think that is folk wisdom to be followed. Incidentally, the Scandinavians seem to be really passionate about their outhouses (just look up “Torrdass”), their history, styles, and construction, so they seem to know what’s going on better than most. I’ve read that bamboo is especially tolerant of high nitrogen and salts, so not sure if it’s better to make a native rain garden to drain our mixed waste water to along with excess rain runoff, or have a separate mulched and planted area for it. Ideas on that front are welcome! 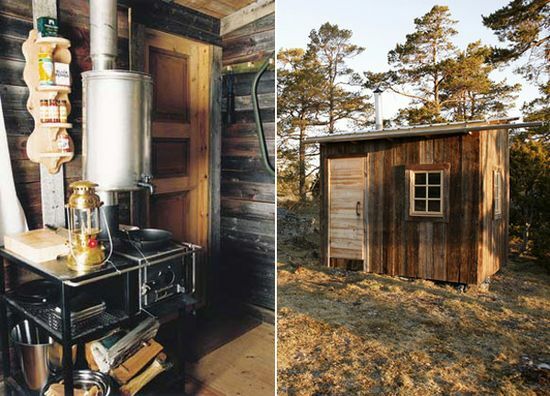 I was on the website for a Swedish cabin and “barn-house” company named Arvesund, and noted that one of their traditional hunter’s cabins had a spiffy setup: a cast iron stove/kitchen with cook burners, and a stainless steel water tank with spigot that wrapped around the stovepipe, looking almost integral with it. And I thought to myself, I want one. Bad. 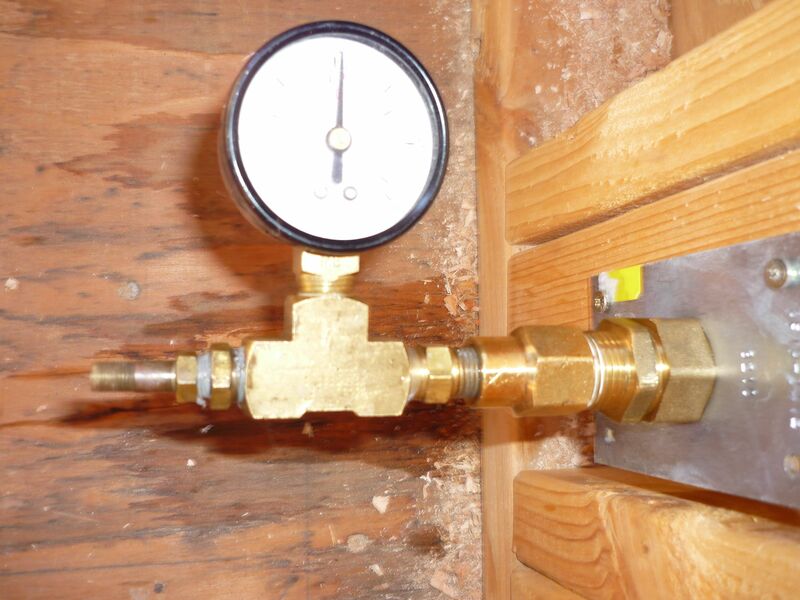 We do not like propane dependency in the slightest, and the idea of wood-heated hot water is very appealing to us. We have a propane stove and water heater out of necessity at this time, but we would love to move away from those when we can. We chose to have a wood stove (a Jotul 602) as well as the option of electric heat for many reasons, but control over where our energy comes from is one of them. The establishment tells us wood-heated houses “Are bad for the environment,” “Wood is a scarce resource and burning it pollutes the air,” and “Wood heating is inefficient,” and about wood-heated water systems that, “They aren’t safe.” We thought, what have people done for thousands of years to heat their water? And what happens in a forest fire? And have you checked where we live? We supply lumber to the world – what would be better than using wood that grows here, and returning the ashes to where it was grown? Isn’t that completing the life cycle better than anything you would do? In answer to the statement “wood heating is inefficient” I would agree that the way we commonly burn wood in the U.S. is. Most Americans are unaware that the way we burn wood now is not the best or even the traditional way, merely the easiest-to-sell way. And if they are aware of the former, they assume there must be a very expensive, over-engineered catalytic woodstove that is the answer. There is no awareness of how woodstoves work, or don’t, as it were. However, the masonry-heater, kachelofen, kakelugn, hypocaust, or rocket-stove (versions of the same thing) that has been used since Roman times is so efficient that the air that exits your house is barely warm, and invisible because all of the gases were completely combusted. Those hand-built stoves are the old way – burn the wood so hot that even the volatile gases (smoke) burn, and store that heat in a thermal mass – tile, stone, cob, water, etc.so the heat is not lost, but slowly radiated back, in the form of conductive heat, the best kind for heating people. Of course, as with life, the answer is not so simple as burn wood, without thinking, as much as you like. Wood-burning fits in well with passive solar and heavy insulation as part of the solution. I see the drawbacks to wood for heating your house or your water as: you have to use your head when heating that way – it is not idiot-proof. You can burn yourself, asphyxiate, destroy your water-heater, set things on fire, or melt them if you don’t know what you are doing. You have to live in an area with many trees to make it ecologically sound. Ideally, you burn your wood as close to 100% efficiency as possible, and with all things tiny-living, the stove should perform more than one function to justify its space. But I can only assume that the reason we are told, in the Pacific Northwest of all places, that wood heat is bad, is out of ignorance, belief that we are stupid, or because they would rather sell us something than have us be self-sufficient. I suspect it is a mixture of all three. Well, a masonry heater is awesome and I would totally have one in a tiny cabin if that’s what we were building, but thermal mass is heavy. Water is too, but you can drain it out of your house when you move it. 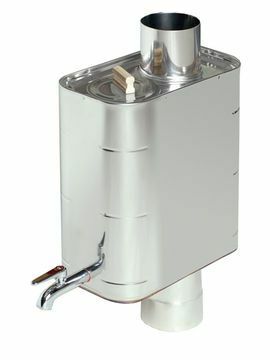 Most wood-fired water heaters rely on an existing water tank system to work, which we don’t have (not even a 6 gallon RV one – we went tankless). I looked and looked at Arvesund’s catalogue, and could find no mention of these beautiful tanks or wood stoves. So I emailed them, the annoying American. They were very helpful: Harvia makes the tanks, a Finnish company that manufactures saunas and associated gear. The tanks run around $400, so we will probably wait to buy one until fall. But we have a local Harvia dealer, so we could acquire one easily. This beauty holds 22 liters, measures 14″ w x 16″ h x 7.5″ d and her pipe inlet measures approximately 4.5″. Made entirely of stainless steel. Joy! Anyone have one that can comment on performance? 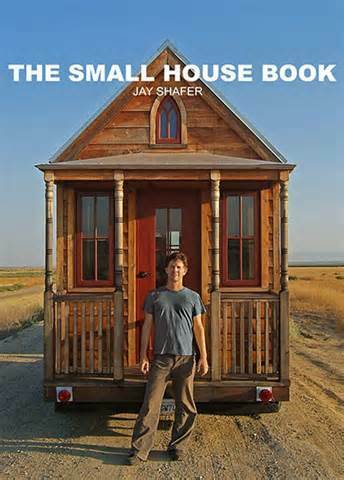 – The Small House Book by Jay Shafer, the founder of Tumbleweed Tiny Houses, now the innovator behind Four Lights Houses (all good websites to visit, too). This book has tons of inspirational pictures, information about legal issues, and is something of a manifesto for the tiny house movement; however, the number of pages devoted to the actual how of tiny house building are very few, with little detail for those that need hand-holding on construction issues. No information in there about wiring, plumbing, or gas, as “Experts” are recommended for those things, which I find really annoying and contrary to the spirit of the movement, but ah well. A great book to start with. 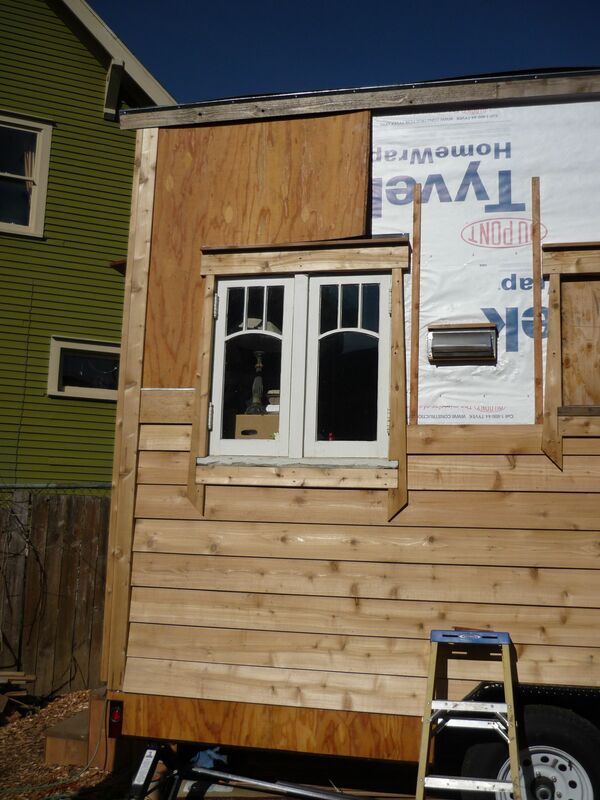 –Go House Go, an e-book by Portland Alternative Dwellings, for $20. Well worth it. Dee Williams wrote it, and based on all of my obsessive review of the different methods of construction, has one of the best, described in detail within. It’s what we’re working off of for our house. Not as pretty to look at, but something you’ll have with you on the construction site. Also bails on description of utilities installation. – Tiny Homes, Simple Shelter by Lloyd Kahn. If you haven’t read his original book Shelter, you really need to. He is a legend from way back. This book, like all his others, is about documenting the grassroots movement with personal stories and LOTS of pictures submitted by those living the dream and their friends who volunteered them. I just love to look through the pictures when I am feeling alone and defeated in my efforts. –Rolling Homes: Handmade Houses on Wheels by Jane Lidz. Published in 1979, it is a great picture-book featuring awesome hippie houses made out of schoolies (school buses), logging trucks and what have you from the 70’s. Great inspiration. –Tiny Systems for Tiny Houses – by Abel/Zyl Zimmerman, perpetually in a state of almost being published, when it does come out I’m sure it will be good, since it is the ONLY book thus far that claims to tackle tiny house utilities. Zyl is something of a Renaissance man, and makes beautiful wooden vardos and lives in one, so you should check out his gallery. He also does consultations. www.tinyhouseblog.com – probably the best and least commercialized tiny house website, with pictures just for fun, blurbs on new tiny house businesses, and lots of articles submitted from readers all over the world. Kent Griswold does a great job with this blog. www.tinyhouseswoon.com – ’nuff said. Some of the best pictures out there of tiny houses. www.pinterest.com – search “tiny houses” and you’ll find all those plotting their escape in pictures. There are many blogs by individual tiny housers, so see the side bar for some good ones. 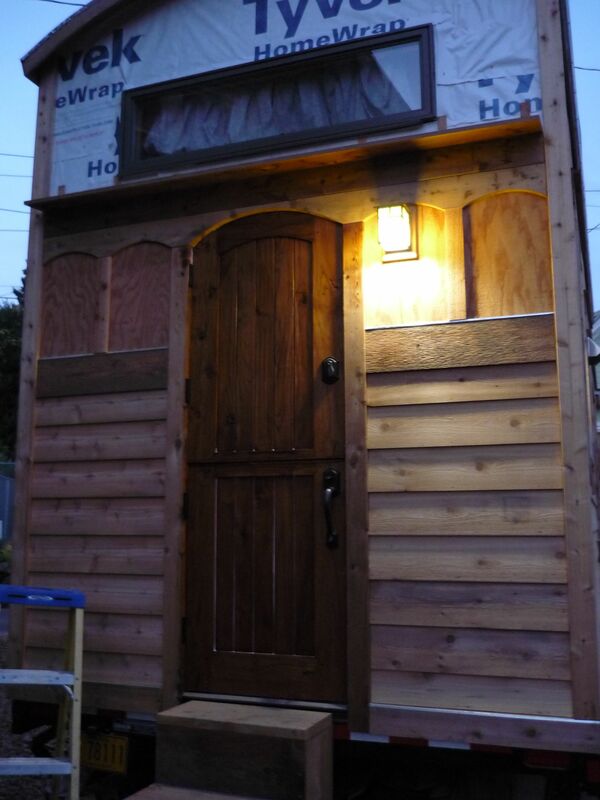 We created this WordPress page as a journal of our project, the creation of a daedala, a well-made thing, in the form of a tiny house. A tiny home that is beautiful and vital, a house made by clever craftsmen and women, with our experience shared so that others may learn and be inspired. There are so many good reasons we want to do this, but chief among them was our realization that the math of American cost-of-living vs. quality of life does not add up favorably for our generation, is worsening with each year, and is unlikely to change without a radical change of Zeitgeist. As we see it, the driving force behind the first-world economy are the people fighting the tide of debt which we are all entrapped in, the ends justifying the means, although the end is never known or chosen. Our sense of community, of responsibility, and the honest wealth of family & friends, of simplicity, of time and self-sufficiency, is lost and forgotten. We choose to fight, to live and revive those things, to make a path so that others will follow and way will be made easier. We choose to exit the vicious cycle of blind consumption and live; we want to die leaving behind children that we raised ourselves, a life lived meaningfully with uncluttered minds and souls, and no debt, in any form, to pass on. We feel lighter already. Who Knows What Week it Is? Chronicling the unfurling of a beautiful little house. Art, nature & transformations: lessons of a tiny house. Creating "new" from old, building and living in a tiny "reclaimed" house. Beginning in 2012, I will live in this 216 square foot space as I pursue my PhD studies in Literature and the Environment. In this way, I hope to live a little smaller, leave a little lighter, and learn in what ways formal study can be acted in the every day.